If it catches on, indoor aquaculture could play a critical role in meeting the needs of a swelling human population, Nordic CEO Erik Heim says. He believes it could do so without the pollution and other potential threats to wild fish that can accompany traditional aquaculture—although the indoor approach does face environmental challenges of its own. “There’s always some risk, but the risk of the land-based system is a small percentage of the risk of an outdoor system,” says Michael Timmons, an environmental engineer at Cornell University who has studied aquaculture for more than 20 years and is not involved in the Nordic project. Fish farming has often been touted as an extremely efficient way to produce animal protein: the Global Aquaculture Alliance claims 100 kilograms of fish feed can deliver up to 15 times more meat than an equivalent amount fed to cows. The industry has gained international traction, with farmed fish surpassing wild-caught ones (pdf) in the global food supply in 2014. But traditional fish-farming methods come with significant environmental drawbacks. 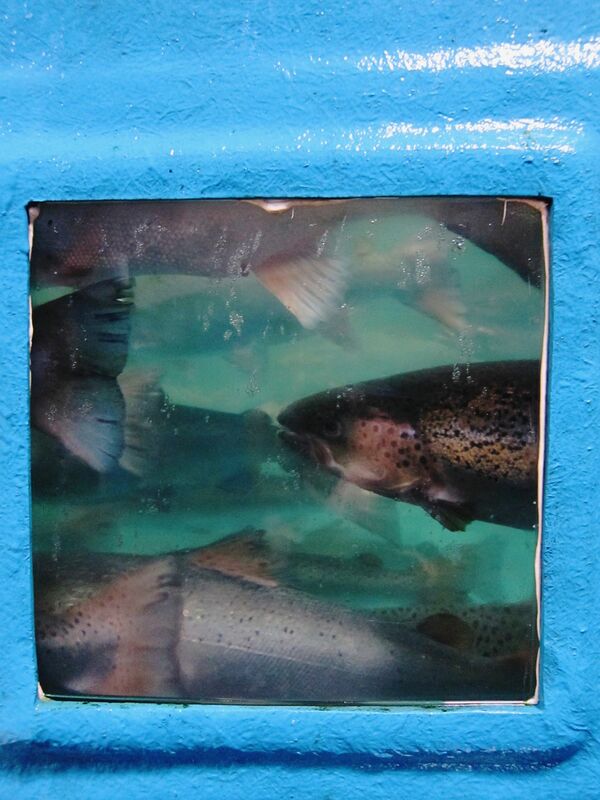 For example, salmon farmers in Norway and Chile—the world leaders in salmon production—typically use open-ocean cages that corral fish in suspended netting or pens. This setup allows waste to flow directly into the environment, along with pathogens and parasites that can infect wild populations. Open-air pond farms—found worldwide and representing the most common type of aquaculture in China, the top global producer of farmed fish—also have a track record of polluting local waterways with fish effluent and veterinary medicines that are used to keep disease at bay. Timmons contends land-based indoor systems can greatly reduce such risks. They isolate fish from the environment and remove most of the waste from the water using recirculating aquaculture systems (RAS), which are akin to filtration systems in a household fish aquarium, he says. But to date, indoor RAS farms have made up only a tiny fraction of the global market and are much smaller than Nordic’s planned operation. For example, Blue Ridge Aquaculture—the world’s largest RAS tilapia farm, located in Virginia—produces less than 10 percent of the quantity of fish Nordic expects to produce in Maine. This recirculating technology has existed in some form since the 1970s, but has evolved enough in recent years that the Monterey Bay Aquarium’s Seafood Watch now ranks RAS-farmed fish as one of the most sustainable seafood choices available. So “the natural thing to do is to scale up,” Heim told Maine residents during his recent presentation. 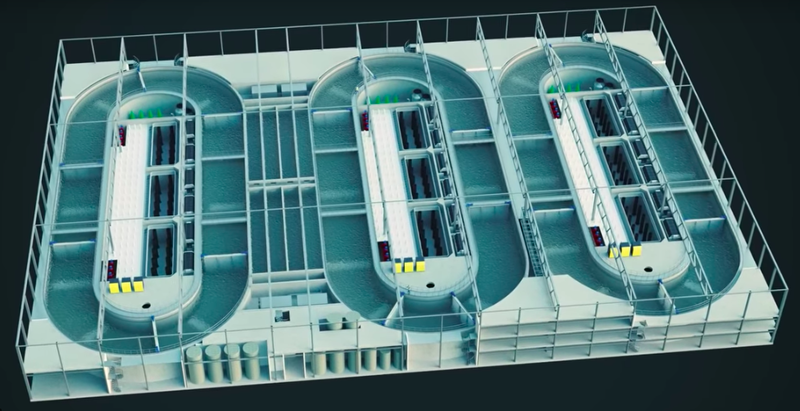 The Belfast operation would include 18 of what Heim says would be among the world’s largest aquaculture tanks—each three times the volume of an Olympic pool—and would ultimately produce 33,000 tons of fish, or roughly 8 percent of U.S. consumption, each year. The company plans to construct a similar farm in Norway next year that would contain tanks the same size, he says. Although there are questions as to whether scaling up increases such a system’s environmental riskiness, some experts think the technology can make a sustainable transition to the big time. Community members in Heim’s audience voiced concerns about how wastewater might affect nearby coastal waters, but Timmons says the small amount of water discharged from RAS systems (from tank overflow and spray-cleaning waste from filters) is often cleaner than when it enters. Water in RAS tanks flows through a bubbling container called a bio-filter, in which bacteria consume fish urine and convert it into a form of nitrogen that is safe for the fish and environment, says Michael Schwarz, director of the Virginia Seafood Agricultural Research and Extension Center. Physical filters gather fish feces and leftover food that can be stored away and resold as compost or raw material for biogas. Ozone treatment helps break down frothy organic solids, and ultraviolet light is used to kill pathogens. This risk of human error should not be overlooked, says Brian Peterson, director of the National Cold Water Marine Aquaculture Center in Maine, where he uses recirculating systems to raise salmon for research purposes. Bio-security routines that require sanitizing hands and dipping shoes in disinfectant bins minimize the risk of disease and the need for antibiotics that other forms of aquaculture heavily rely on, says Peterson, who has advised Nordic Aquafarms regarding best practices. However, just one employee who fails to complete the process correctly or neglects other basic protocol could contaminate the operation—with pathogens potentially looping through the recirculating system and killing an entire tank of fish. Large-scale companies could guard against this with monitoring equipment that lets them respond quickly to any issues, Peterson says, adding that strict government permits require routine monitoring that would also detect unusual levels of discharge in wastewater.